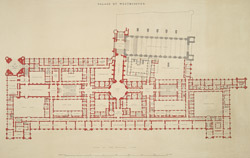 When the fire of 1834 destroyed much of the existing parliament buildings, Charles Barry was chosen in a competition to design the new ones. Barry was a Classical architect and enlisted the Gothic revivalist Augustus Welby Pugin to aid him in the design. This is a plan of the completed complex. Frederick Crace was employed in the interior decoration of the complex.